Home/Philanthropy/Is philanthropy in the cards? No matter what you call it, charity, giving, or philanthropy, the topic certainly is not in the mainstream of most conversations whether it’s among friends or family members. In fact, as vital as the giving of time, talent, and money is to the well-being of the fabric of our society, unless you are in the nonprofit profession, the topic is seldom brought up in private or public conversation. One could surmise that it is either taboo or just awkward to know how to start a conversation about giving. Could talking about issues and causes that pain the heart and prod open the checkbook be considered boasting, prying, or self-interest? And if so, how can we change the course of conversation to include meaningful discussions about charity, giving and philanthropy as it relates to who we are and what we do in our daily lives? Perhaps it is in the cards! 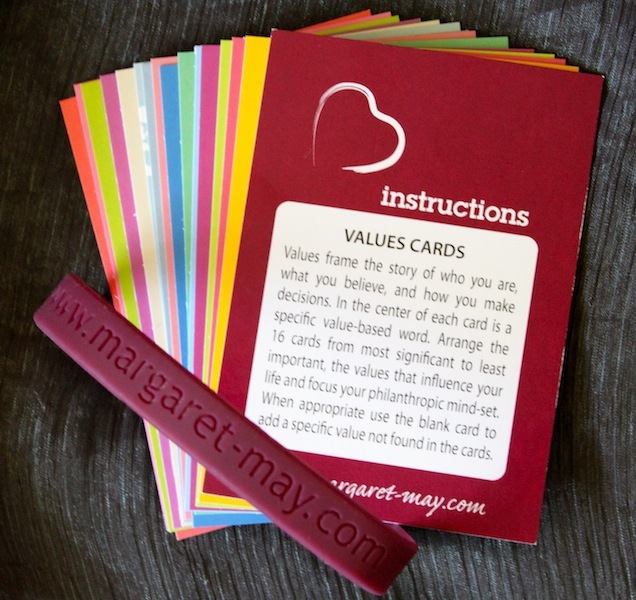 Not just any cards, but rather cards that encourage conversation about what it means to be philanthropic; cards with quotes that not only challenge us but also stimulate our thinking and engage our minds; cards that help us articulate our values and beliefs that inspire our giving plan. 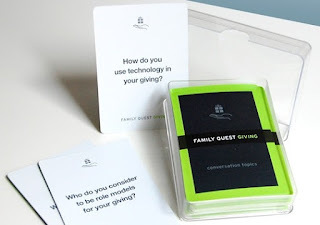 Yes, decks of cards with well-crafted, thoughtful open-ended questions that invite enriching dialogue on the topic of giving. I have found three different decks of cards that are extremely useful in getting the conversation started with my donors and clients of every generation – young in age and young in spirit. I encourage you to contact each of the organizations to get a deck. The 42-card Family Quest Giving Deck is the creative endeavor of 21/64, a nonprofit consulting division of the Andrea and Charles Bronfman Philanthropies and Relative Solutions. Each card features one open-ended question, such as “Before today, with whom did you have conversations about giving?” “What knowledge and skills do you bring to your giving?” “When do you say ‘No’ to a request for money?” The deck also includes two wild cards to create your own questions. Imagine sitting around the table or relaxing at a campsite, pulling out a Family Quest Giving Deck and starting a conversation that helps everyone better understand their thoughts and motives for giving. And better yet, it allows them to actually express their feelings on such an important topic. Trainer and coach, Jan Elfine, EdD, MCC, who specializes in creativity and innovation, designed a 60-card deck of double sided cards, Quotes to Inspire. Questions to Inquire. According to the instructions, “Quotes invite the listener into a way of thinking, the spirit of the quote. The questions then move the thinking along.” For example, the quote from Goethe on one side of the card reads, “Whatever you can do, or dream you can do, begin it. BOLDNESS has genius, power and magic in it. Begin it now.” Turn the card over and the questions are, “How will you be bold? What will you begin?” In a philanthropic context, this could lead one to begin by exploring the website, www.boldergiving.org. From experiences with clients and donors at my Institute for Women and Wealth, I have created a 16-card deck of Value Cards. I believe values frame the story of who you are, what you believe and how you make philanthropic decisions. In the center of each card is a specific value-based word such as “Abundance, Gratitude, Love, and Courage.” There are a few blank cards to fill in with your unique values, too. Many times when I am facilitating a family meeting, I will distribute a set of cards to each family and invite them to spend time individually choosing three of the most significant values that pertain to their current lifestyle. Once the family members come back together, each person has the opportunity to share their thoughts and feelings about those values that are central to how they make decisions regarding the giving of time, talent and money. It is quite amazing to experience the transformation that takes place as conversations around diverse values often result in love, respect and family unity where misunderstanding and miscommunication had previously harbored discord. Yes, philanthropy may well be in the cards with a deck stacked in your donor’s favor.